MOBILE, Ala. — John Dorsey hit three or four milestones along last year's draft process with Patrick Mahomes, but the big one—the one that put Mahomes over the top—came April 5 in Kansas City. Chiefs coach Andy Reid, offensive coordinator Matt Nagy and assistant quarterbacks coach Corey Matthaei met with Mahomes at the start of his six-hour pre-draft visit, and took him through elements of the team’s playbook. At the end of the day, the coaches summoned Mahomes back to see how much of what he learned in the morning he actually retained. Three weeks later, the Chiefs traded the 27th pick, their third-rounder and their 2018 first-round pick to move up 17 slots and draft Mahomes 10th overall. A lot has changed since. That was nine months ago. Dorsey didn’t make it to summer in Kansas City, and has since taken over as general manager in Cleveland. But this remains the same: He’ll be spending the next few months looking for a similar moment of clarity on the draft-eligible quarterbacks. In this week’s Game Plan, we’ll hit a little bit of everything. We’ll go to the Patriots’ division rivals to see what life in the NFL goliath’s shadow is like. We’ll check in on the Giants and Pat Shurmur. We’ll explain why the Eagles’ trade of Sam Bradford had a massive trickle down effect on the franchise. We’ll go to John Elway on Baker Mayfield. And we’ll look at the rich free-agent quarterback market. We’re starting here in this Gulf Coast city, and with the guy who arrived holding all the cards. Dorsey goes into this draft season armed with two of the first four picks, five in the first two rounds, and 10 in the first five rounds, and that’s without even getting to the nine figures of cap space the Browns project to carry. But chances are, Dorsey’s ability to make it work in Cleveland, a place so many others couldn’t, will ride largely on his ability to get the first one right. That’s because, while he won’t yet commit to taking a quarterback (“Best available player,” he said when I asked him about that), the assumption is the Browns will. And that means chances are Dorsey will be tying his professional future to that player. He’s comfortable, because he’s done the work. Without a job, the ex-Chiefs GM spent the fall studying about seven hours of film per day. Mondays and Tuesdays were for pro scouting; Wednesday, Thursday and Friday were for college scouting. Then, on plenty of Saturdays, he’d head out to live-scout a nearby college game. One of those was Oklahoma vs. Kansas in November, which happened to be the afternoon of Baker Mayfield’s infamous crotch grab. After Dorsey took the Browns job, he saw USC’s Sam Darnold live in the Cotton Bowl. And this week presents Dorsey’s first live exposure to Wyoming’s Josh Allen, leaving UCLA’s Josh Rosen as the only presumptive top four quarterback who Dorsey hasn’t yet seen in person. So clearly, Dorsey and the Browns aren’t at square one with the quarterback prospects. But as Dorsey’s experience last year with Mahomes would indicate—we’re still more than two months away from where the Chiefs were when they brought him in last April—they’re not close to a conclusion yet either. So after this week, that’ll likely mean meeting with the four quarterbacks privately at the combine, going to their campuses to work them out, and then bringing each in for a Top 30 visit. At this point last year, Dorsey and Reid knew that Mahomes had rare tools, and a ways to go developmentally. Which made what they learned from this point forward—that he could absorb teaching, retain information and grow—just as important as the skills the Texas Tech junior brought to the table. It makes sense, then, that the same will go for Darnold, Rosen, Allen and Mayfield this time around. Can Darnold, with his funky delivery, work as a cold weather quarterback? Can Rosen grow up personally and hold up physically? Can Allen learn at the rate Mahomes proved he could? Can Mayfield manage his outbursts? Can the Browns build an offense that works for him? All those questions still need answers, and that’ll make the next few months interesting as he decides who the “best available player” is. As for the chance it’s a quarterback? The Browns new GM was laughing as those words came out, because, of course, he does know. And we all know how important it is for Cleveland to get this one right. 1. I wouldn’t underrate the presence of Jeremy Bates as the Jets’ new offensive coordinator as a factor in the Kirk Cousins chase. Bates is a Mike Shanahan disciple with a football mind similar to those of Sean McVay and Kyle Shanahan, both of whom coached Cousins and loved him as a player. So certainly, there’d be a comfort level for Cousins there. 2. Give new Titans coach Mike Vrabel credit for thinking outside the box in pursuing Ohio State’s Ryan Day for his open offensive coordinator spot. Day would’ve brought an innovative offensive approach that fit Marcus Mariota. And because he’s close with Chip Kelly, Day also would’ve given the team a direct line to consult with Mariota’s college coach. 4. The Jaguars’ biggest decision this offseason is on Blake Bortles, but his No. 1 receiver, Allen Robinson, presents another one. Robinson is coming off a torn ACL, which muddies his value as one of the best young receivers in the NFL. This is a little bit like the situation the Eagles faced with Jeremy Maclin in 2014. Philly wound up signing Maclin to a one-year deal, then lost him to KC in 2015. 5. It’s no surprise that Vikings QBs coach Kevin Stefanski will interview for the offensive coordinator job in Minnesota. Seen as a rising star on the staff—he was moved from running backs to quarterbacks this fall—there were rumblings he’d go with Pat Shurmur to New York, and at least giving him the chance to compete for Shurmur’s old job should work to keep him happy. • ANDY BENOIT: Which version of Nick Foles will the Patriots game-plan for ahead of the Super Bowl? 6. Was interesting seeing Bill Belichick concede that Chris Long is a better fit for Jim Schwartz’s aggressive scheme than he was for New England. Long said on my podcast last spring that scheme fit was a major reason for leaving Foxboro. And part of it was his belief that he’d hold up physically better playing in the Eagles’ style of defense. 7. Todd Haley has clashed with quarterbacks in the past, but there’s no question he’s gotten results from all of them. He helped revive Kurt Warner’s career in Arizona, got Matt Cassel to a Pro Bowl in KC, and created Ben Roethlisberger 2.0 in Pittsburgh. Good history for a team that could be assimilating a veteran starter (Alex Smith?) and a highly-drafted rookie backup in a few months. 8. We mentioned it before, and I still expect that league spokesman Joe Lockhart will the first of a few people to exit the league office, or at least have his or her role rearranged, over the next month or so. Last month, we listed a few names as a part of our story the league’s winter meeting. 9. A mediocre corner class in the draft could help guys like New England’s Malcolm Butler and the Rams’ Trumaine Johnson in free agency, similar to the way last year’s dreadful offensive line class in the draft inflated prices on the 2017 free-agent market at those positions. 10. If you don’t know the story of Central Florida LB Shaquem Griffin, read up on him. Born with a deformed left hand that was amputated at age 4, Griffin grew to become a star at UCF, and has excelled in Mobile as the Texans staff has featured him all over the field (safety, linebacker, edge rusher) during Senior Bowl practices. 1. Fighting the empire. With the Patriots ticketed for their eighth Super Bowl in 17 years, I figured it’d be a good time to check in with the AFC East rivals they’ve frustrated for nearly two decades—the last time a Tom Brady-led New England team didn’t win the division was 2002. And in doing so, what I really wanted to know was whether or not the other three take anything from having to chase a dynastic power. And Beane mentioned doesn’t think that’s just about coaching—it’s also in the types of people New England brings into the building. Accordingly, the Bills have been aggressive in trading away players (Sammy Watkins, Ronald Darby, Marcel Dareus) that they didn’t quite feel fit their cultural vision. Likewise, the Jets’ focus in last year’s draft was on football-smart prospects, and their first two picks, safeties Jamal Adams and Marcus Maye, are off the charts in that regard. And in Miami, the trade of tailback Jay Ajayi before deadline in October was another move that put the makeup of a team in front of a desire to simply collect talent, something that’s at the heart of New England’s philosophy. None of this means the Jets or Dolphins or Bills are catching the Patriots next year. It just means they’re paying attention, which is a good thing for teams that have shown promise of late. 2. The fallout of the Sam Bradford trade in Philadelphia. When Eagles vice president of football operations Howie Roseman signed Sam Bradford to a two-year, $36 million deal in March 2016, inked Chase Daniel to a three-year, $21 million deal days later, then traded up twice to get Carson Wentz the next month, plenty of folks on the outside looked at the reinstated Eagles personnel boss like a drunk guy with a machine gun. Two years later? He looks more like an assassin. 3. Why the Giants picked Pat Shurmur. We said a few weeks ago that the Giants aren’t the type of franchise that is going to adjust who they are for a coach. The coach has to fit them, not the other way around. And so that’s where we’ll start in why Vikings offensive coordinator was the right pick. That lines right up with the buttoned-down Giants. But beyond being the right fit, the time for Shurmur is right too. No matter who was picked as coach, two things were going to be paramount for the new staff—an ability to help find the next quarterback and put out the five-alarm fire in the locker room. An ability to handle both of those things are on Shurmur’s résumé. Shurmur was a part of drafting and developing Sam Bradford in St. Louis in 2010, then made the most of an injury-riddled quarterback room in Minnesota over the past two years, retrofitting the offense on the fly for Bradford after becoming coordinator, then doing it again this year for Case Keenum. So whether it’s Josh Rosen, Sam Darnold, or no quarterback with the second overall pick, GM Dave Gettleman will get a worthy sounding board in the process. If a quarterback is the selection, that player will get an experienced mentor known for listening to his signal-callers and building offenses around their preferences. As for the second piece of the equation, the Vikings had plenty of blazes of their own to put out over the past few years, and the quarterback injuries are just the start of it. There was an even worse plague of injuries to the offensive line, Adrian Peterson’s injury in 2016 and Dalvin Cook’s this year, the resignation of Norv Turner, and the eye situation that cost Mike Zimmer a game. Shurmur was steady through all that, and the Vikings fought through it all to get to the NFC title game this year. So if you put the pieces together, the hire makes sense as what the Giants need at the moment. Whether it’ll be the right thing long-term remains to be seen. 4. John Elway getting what he wanted. Plenty of scouts made comments early in Senior Bowl week about the North team’s roster, and what it said about the pull of Broncos EVP/GM John Elway. It was a commentary made about the talent there in general, but in particular the quarterbacks that were assigned to Vance Joseph’s staff, a crew that includes Mayfield and Josh Allen. So I went to Elway on Wednesday just to see if he wanted to set the record straight, and he obliged. Elway added that he hopes it’ll also serve to help find later-round sleepers. But really, this offseason for the Broncos is about getting the quarterback position right. And so there’s no question that finding a way to exert a little influence to get the right ones on their Senior Bowl roster was a pretty slick and wise move. We all thought the curtain had dropped on the Blake Bortles Era in Jacksonville on Aug. 23. An unsightly start to the fourth-year quarterback’s preseason led to Doug Marrone turning to Chad Henne for the Jaguars’ third preseason game—and seemingly closing the book on the third overall pick. Our lesson this week? There will be a lot of moving parts at quarterback over the next three months. One veteran personnel director said Wednesday that he expects teams to find ways to settle their situations before the mid-March open to free agency, and there may not be the crazy couple months that many of us had anticipated going back to the beginning of last season. • Scouting combine, Feb. 27-March 5. 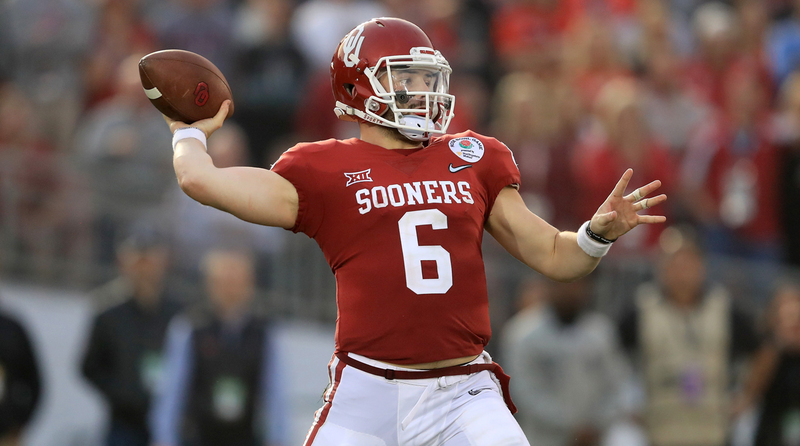 The expectation is that four quarterbacks (USC’s Sam Darnold, UCLA’s Josh Rosen, Wyoming’s Josh Allen, Oklahoma’s Baker Mayfield) have a great shot at going in the top half of the first round, and that should start to crystallize in Indianapolis, with the Browns, Giants, Broncos, Jets, Redskins (potentially) and Cardinals carrying a need and a Top 15 pick into the proceedings. • Franchise tag deadline, March 6. The day after the combine, at 4 p.m. ET, Washington will have to make a decision on whether or not to tag Kirk Cousins at $34.48 million. I’m told they’ve had internal discussion, both last year and this year, about letting him go to the market, because they feel it’s the only way to ascertain his true value—and that tagging him again would only put the team right back here in 2019. The Vikings, too, have decisions to make, but it seems unlikely that they’d tag Teddy Bridgewater, Sam Bradford or Case Keenum at more than $23 million. • Free agent tampering period opens, March 12. Bridgewater, Bradford, Keenum and Cousins could all be available. This is where the value of each should show itself. Jacksonville could, conceivably, test those waters during this 48-hour stretch before making a call on Bortles. Then there’s Drew Brees, who can’t be tagged and is up—no one thinks he’ll leave New Orleans, but his history has been to maximize his leverage, and getting to this point without a new contract would accomplish that. • 2018 League Year opens, March 14. At 4 p.m., teams can deal for Alex Smith. Obviously, the pieces of a trade can be put in place beforehand—the Chiefs have already started to discuss it—but this is when the trigger can be pulled. • Tyrod Taylor’s option, March 16. The Bills quarterback is due $16 million for 2018, and $6 million of it is due in the form of a roster bonus on the third day of the new league year. • The NFL draft, April 26-28. The finish line for the draft eligibles. By then, some teams that didn’t have needs will have one, and others that did won’t. And if the draft feels a long way off, that’s because it really is. Plenty of time for fireworks at quarterback between now and then—and more potential for them than we’ve seen in a long time.